St Andrews Old Course Golf Breaks. The Old Course at St. Andrews Links is thought to be the oldest golf course in the world. The Old Course itself has a great deal of history to it is uncertain when golf was first played on these lands. There is a great deal of conflicting evidence regarding this, however it is clear that golfers have played on this course for over 600 years, with the exception of a 45 year period when golf was banned from 1457 to 1502. The Old Course is located in Fife, Scotland and is one of seven golf courses on the Links. There are many special rules and traditions with The Old Course including the fact that on Sundays the course is closed in order to give the grass time to rest. On this day the course is opened up to the people of Fife to use as a park. The only exceptions to the Sunday rule are when the Open Championships, Dunhill Links Championships, Ricoh Womens Championships, or St Andrews Links Trophy and the St Rule Trophy are being played. The Old Course is highly regarded by professional and every day golfers worldwide and it has held the Open Championships more times than any other golf course in the world. 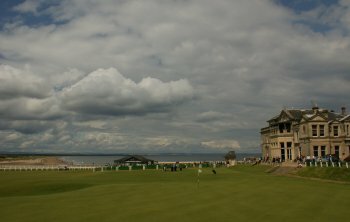 In total the Open Championships have been held on this course 27 times and it is set to hold them again in 2010. The Old Course is one that serious golfers from around the world dream they will one day have the opportunity to play on. As it has many unique features that will only be found at this specific location including its distinctive double greens and the fact that it can be played in two different directions. In general the course is played anti clockwise with the exception of three days during the first week in April. The fact that the Old Course at St. Andrews is still a public course may be why it attracts so many visitors to it each year. Along with the fact that so many professional golfers consider this particular course to be one of the hardest yet best courses they have ever played on. In fact when Tiger Woods won his very first Open Championship at The Old Course he claimed that the course was his favourite. In addition to its famous playing grounds, on the property lays the R&A Club house, a historic castle like building whose members are responsible for governing and organizing the Open Championships. It is often assumed that this club owns the Old Course however in reality there are many different clubs that have the privilege to play on this course, and it is open to the general public as well. St Andrews Bay Golf Resort and Spa Find the best deal, compare prices and read what other travelers have to say at TripAdvisor sits proudly amidst the rugged, coastal landscape of the North Sea whilst commanding spectacular views of the Bay's golden beaches and medieval St Andrews. The Resort boasts a luxurious 5 star hotel with 209 guestrooms designed with comfort and luxury in mind. Experience 520 acres of rolling landscape with two magnificent golf courses and an array of outdoor pursuits from quad biking to coastal hikes. For a more tranquil experience, the hotel's European style spa rejuvenates both body and soul.